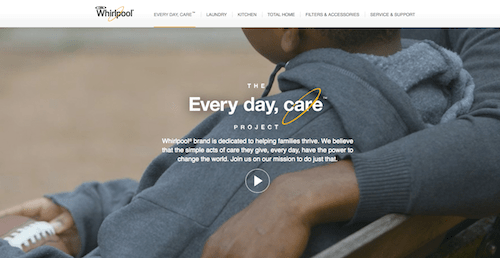 Whirlpool brand has launched the Every day, care Project, a program that includes a series of “social experiments” to demonstrate the value of everyday tasks done with love. For its first “social experiment”, Whirlpool is sharing a video showing the story of a “sandwich generation” family with a mom taking care of both a child and her own parent (video here or below). Whirlpool has partnered with Upworthy to distribute the video and is using the #EveryDayCare hashtag to encourage consumers to share their own moments of care. This type of feel-good brand platform featuring poignant stories of real people is becoming increasingly prevalent and a method to watch. Whirlpool is effectively and authentically associating its everyday products with a powerful emotion: caring. The campaign microsite takes the opportunity to share what it’s doing to care for others via its partnership with Habitat for Humanity as well. Will it move the needle on brand loyalty or sales? We can’t wait to find out!